(Nanowerk News) University of Wisconsin-Madison researchers have achieved a nanoscale laser structure they anticipate will produce semiconductor lasers in the next two years that are more than twice as efficient as current continuous-wave lasers emitting in the mid-infrared. "The novel structure will produce lasers with more power and that are more efficient, reliable and stable," says Philip Dunham Reed Professor of Electrical and Computer Engineering Dan Botez, who created the new structure with Electrical and Computer Engineering Professor Luke Mawst. 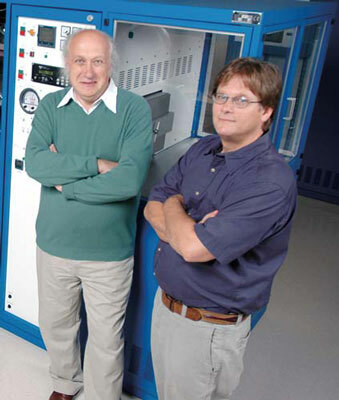 Professors Dan Botez and Luke Mawst. These next-generation lasers could benefit a wide range of industries, as they could be used in biomedical devices, environmental monitoring devices, missile avoidance systems and even food packaging processes. This wide range of applications is possible because the researchers have all but eliminated the temperature sensitivity for lasers operating in continuous-wave mode, meaning the laser emits uninterrupted, coherent light. "For example, with current mid-infrared technologies for detecting explosives, lasers can detect from only approximately 30 feet away," Botez says. "With these lasers, devices could detect explosives at more like 300 feet away." Also important is that the researchers created the new laser structure via a scalable industrial process. How is a regular semiconductor laser built? Electrons that spontaneously move between bands and produce light can be used for devices like LEDs. However, to produce a laser beam, researchers place the lattice of atoms in a cavity with mirrors, and the generated photons stimulate the electrons to return to the valence band, thus releasing a photon with the same energy as the stimulating one. The original photon and the new photon are in phase with each other and will further stimulate the release of other photons, thus continuously amplifying the number of photons and bouncing off the cavity mirrors. The process repeats until the cavity reaches a threshold for oscillation and light is directed out of the cavity in a coherent laser beam. This is how a standard semiconductor laser works, but the problem is that band-to-band transitions are limited to wavelengths below approximately three microns, which correspond to transition energies of about .4 electron volts. If the transition energies are smaller, which would correspond to longer wavelengths, the energy is released as heat, rather than light—meaning traditional semiconductor lasers have limited emitted-light wavelength potential. To overcome wavelength limitations, scientists from Bell Laboratories developed a laser by quantizing the energy bands, meaning they broke the energy bands into sub-bands. As the lattice structure vibrates, it causes the electrons to move rapidly between sub-bands, and the transitions between sub-bands cause the electrons to emit energy. However, the process is extremely inefficient since electrons transitioning between two sub-bands emit 1,000 phonons (quantized lattice vibrations) for every one photon. Bell Labs scientists reduced this inefficiency by creating a "cascade" structure by .stacking. 40 sub-band photon-emitting stages. These stages allow one electron to be used to emit a photon 40 times as it sequentially moves and transitions along the cascade structure. The result is only 25 phonons are emitted for every one emitted photon and then lasing action can be achieved. The problem with this type of laser is that fixed compositions of the layers for a particular stage, which repeats along the cascade structure, result in electrons escaping from the structure. Imagine dropping a ball down a ladder; the ball may hit the first couple of steps, or sub-bands, but as it progresses along the ladder, it can veer off course and drop off the ladder entirely. A continuous-wave laser system, which operates continuously, heats up internally as electrons escape from the structure, which in turn limits the emitted power and the overall device efficiency. This loss of electrons, or carrier leakage, has been a major barrier to increasing laser efficiency for practical applications. About five years ago, a process for growing multi-layer semiconductor structures became available for fabricating quantum-cascade lasers. Called metalorganic chemical vapor deposition (MOCVD), the process is scalable, unlike previous crystal growth techniques suited for laboratories but not manufacturers. MOCVD involves exposing a substrate to high heat and chemicals, causing layers to form on the substrate in an atomic-lattice configuration. Unlike previous crystal-growth techniques, MOCVD allows researchers to fabricate cascade-laser structures with stages composed of layers of varying composition. Botez and Mawst are using the MOCVD process to grow varying-composition structures that prevent carrier leakage. To compensate for the added strain caused in the structure by creating deeper (quantum) wells, they also create taller barriers. Now, rather than electrons escaping from the system like balls falling off a ladder, the system works like a set of tiered boxes, with a ball getting caught at each stage. This ensures that electrons will efficiently produce photons in every stage of the cascade structure. The new structure is called a deep-well quantum cascade laser. "By suppressing carrier leakage, there is about 2.5 times less heating in the device while the laser is in continuous-wave operation," says Botez. "This is a dramatic improvement that means the device will be almost temperature insensitive". The result will be continuous-wave lasers that Botez anticipates will achieve at least 20 percent wall-plug efficiency, which is the electrical-to-optical power efficiency of a laser system. Twenty percent efficiency would be roughly double the current world record for practical continuous-wave quantum cascade lasers. This new structure, coupled with the fact that MOCVD is a process suitable for mass production, means that optimized mid-infrared lasers can become much more widespread in medicine, the military and a wide variety of industries. "The effect will be that as you get more continuous wave power you should also get better long-term reliability and stability, because these lasers will be much less sensitive to temperature variations than conventional quantum cascade lasers," Botez says. Botez and Mawst are actively interested in commercializing the technology, which is covered by two issued and one pending U.S. patents through the Wisconsin Alumni Research Foundation.